One thing that I just can't handle is clutter. Organization is and always has been essential in everything I do. Everything in my home has its proper place and I'll admit that I'm OCD! Whether you have a little bit of cupboard space or a large pantry, the Cansolidator Cupboard is a lifesaver! It makes organizing your canned goods quick and easy. Plus, it makes keeping them that way a breeze. It rotates your canned goods for you, keeping the oldest ones up front to be used first. 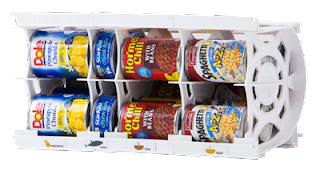 The Cansolidator Cupboard not only helps with organization but it also helps lower your cost of food. By keeping the oldest cans up front and the newest ones in the back of the line, you won't have to worry about expiration dates as much which means less waste! Frugal and convenient: two of my favorite things! Of course these are perfect for at home but they would also be great for your vacation home or camper as well! Making big use out of a small space is always helpful and appreciated! The Cansolidator Cupboard is a sturdy, convenient way to store up to 20 cans. Featuring SmarTrac technology, the Cansolidator Cupboard is a front loading system that automatically rotates cans on a first in first out basis. It is expandable and stackable, allowing for easy can organization and storage. This is the perfect stand-alone solution for any small cupboard space. Able to hold cans ranging from small tuna size to pineapple. Units may be stacked for space optimization. However, it's recommended that no more than 2 units be stacked. Visit Q2Thrive Shelf Reliance and tell me another product that you would love to have. A special thanks to Q2Thrive for this wonderful opportunity! I like the Raspberry Cake Bars Gift Basket would be very nice for grandma who likes to bake and has EVERYTHING!!! I like the Superme 3 month Freeze Dried and Dehydrated Food Supply. I like the ready racks! I would like to try the Dehydrated Fruit 6-Pack and take a peek at the cookbook! I like The Plenty 39" #10. 1. I follow Being Frugal and Making it Work Publicly via Google Friend Connect. 2. I follow Being Frugal and Making it Work Publicly via Google Friend Connect. I'd love the food rotation system magnetic labels. I would love for my husband to take the Providence Basic Travel Two Person 72-hour Emergency Kit with him when he goes on hunting trips. When it said to follow Riffs and Raffs I assumed it meant GFC but I didn't see a widget for that. I subscribed to it via email. If that's wrong I'll be glad to correct it. I like the pantry plus and the fruit packs! I also like the 2 Person Survival Pack.